The first aim of the physiotherapy examination for a patient presenting with back pain is to classify the patient according to the diagnostic triage recommended in international back pain guidelines. Serious (such as fracture, cancer, infection and ankylosing spondylitis) and specific causes of back pain with neurological deficits (such as radiculopathy, caudal equina syndrome)are rare but it is important to screen for these conditions. Serious conditions account for 1-2% of people presenting with low back pain and 5-10% present with specific causes LBP with neurological deficits. When serious and specific causes of low back pain have been ruled out individuals are said to have non-specific (or simple or mechanical) back pain. Non-specific low back pain accounts for over 90% of patients presenting to primary care and these are the majority of the individuals with low back pain that present to physiotherapy. Physiotherapy assessment aims to identify impairments that may have contributed to the onset of the pain, or increase the likelihood of developing persistent pain. These include biological factors (eg. weakness, stiffness), psychological factors (eg. depression, fear of movement and catastrophization) and social factors (eg. work environment). The assessment does not focus on identifying anatomical structures (eg. the intervertebral disc) as the source of pain, as might be the case in peripheral joints such as the knee. Previous research and international guidelines suggest it is not possible or necessary to identify the specific tissue source of pain for the effective management of mechanical back pain. The subjective assessment (history taking) is by far the most important part of the assessment with the objective assessment (clinical testing) confirming or refuting hypothesis formed from the subjective. Assessment of the lumbar spine should allow clinical reasoning to include appropriate data collection tests from those listed below. History not only is the record of past and present suffering but also constitutes the basis of future treatment, prevention, and prognosis. What is the patient’s age? What is the patient’s occupation? How long has the problem bothered the patient? Where are the sites and boundaries of pain? Is the pain deep? Superficial? Shooting? Burning? Aching? Is the pain improving? Worsening? Staying the same? Is there any increase in pain with coughing? Sneezing? Deep breathing? Laughing? Are there any postures or actions that specifically increase or decrease the pain or cause difficulty?Is the pain worse in the morning or evening? Does the pain get better or worse as the day progresses? Does the pain wake you up at night?Which movements hurt? Which movements are stiff? Is paresthesia (a “pins and needles” feeling) or anesthesia present? Has the patient noticed any weakness or decrease in strength? Has the patient noticed that his/her legs have become weak while walking or climbing stairs? What is the patient’s usual activity or pastime? Before the injury, did the patient modify or perform any unusual repetitive or high-stress activity? Which activities aggravate the pain? Is there anything in the patient’s lifestyle that increases the pain? Which activities ease the pain? What is the patient’s sleeping position? Does the patient have any problems sleeping? Does the patient have any difficulty with micturition? Are there any red flags that the examiner should be aware of, such as a history of cancer, sudden weight loss for no apparent reason, immunosuppressive disorder, infection, fever, or bilateral leg weakness? Is the patient receiving any medication? Is the patient able to cope during daily activities? Although uncommon serious spinal conditions (such as those listed below) may present as LBP in approximately 5% of patients presenting to primary care office:. Has the patient had any other investigations such as radiology (Xray, MRI, CT, ultrasound) or blood tests? The purpose of the objective examination (clinical testing) is to confirm or refute hypothesis formed from the subjective examination. When assessing the lumbar spine, the examiner must remember that referral of symptoms or the presence of neurological symptoms often makes it necessary to “clear” or rule out lower limb pathology. 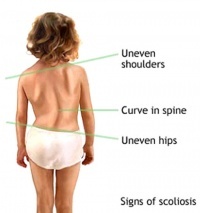 Many of the symptoms that occur in the lower limb may originate in the lumbar spine. Unless there is a history of definitive trauma to a peripheral joint, a screening or scanning examination must accompany assessment of that joint to rule out problems within the lumbar spine referring symptoms to that joint. Examination procedures should be performed from standing-sitting-lying and pain provocation movements saved until last. 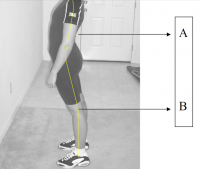 Squat test - to highlight lower limb pathologies. Not be done with patients suspected of having arthritis or pathology in the lower limb joints, pregnant patients, or older patients who exhibit weakness and hypomobility. If this test is negative, there is no need to test the peripheral joints (peripheral joint scan) with the patient in the lying position. Neurologic assessment is indicated where there is suspicion of neurologic deficit. If indicated it may be necessary to perform a haemodynamic assessment. 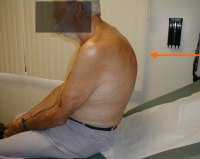 It is crucial for a reliable diagnosis and intervention of treatment to adequately palpate the lumbar spinous processes. Within the scientific world, there has been a debate about the palpation of the spinous processes because scientists assumed that often different persons indicated the processes in a different place (Mckenzie et al). However, Snider et al (2011) have shown that the indicated points of the different therapists lie that the distance between the indicated points of the different therapists is much smaller than it had always been claimed. Obviously, there were differences because some therapists have more experience and others have more anatomical knowledge. Also, the difference in personality between the therapists led to differences in locating the processes. Furthermore, this investigation has proven that it is more useful to indicate different points instead of just 1 point. Also it has been proven that a manual examination to detect the lumbar segmental level is highly accurate when accompanied by a verbal subject response (Philips 1996). If you have little time a brief examination of patients with back pain has two basic purposes. Firstly it will help screen patients for possible serious spinal pathology even though taking a good history is much more important. Secondly it will improve patient satisfaction and effectiveness of the consultation. Obviously, if the history raises concerns that there may be non-spinal pain, structural deformity, widespread neurological disorder or serious spinal pathology it is appropriate to examine the patient more fully as per normal clinical practice. Lumbopelvic disorders are not a homogeneous group of conditions, and subgrouping or classification of patients with back pain has been shown to enhance treatment outcomes. Classification of lumbopelvic disorders should adequately define the primary signs and symptoms and guide therapeutic interventions. The examination allows us to arrive at a diagnosis and impairment classification for the condition. These classification systems help us to avoid the pitfalls of attempts to identify the pathoanatomic cause of the patient’s symptoms. ↑ Henschke N, Maher CG, Refshauge KM, et al. Prevalence of and screening for serious spinal pathology in patients presenting to primary care settings with acute low back pain. Arthritis Rheum 2009;60:3072–80. ↑ Hancock MJ, Maher CG, Latimer J, et al. Systematic review of tests to identify the disc, SIJ or facet joint as the source of low back pain. Eur Spine J 2007;16:1539–50. ↑ 8.0 8.1 Deyo, R. et al. What Can the History and Physical Examination Tell Us About Low Back Pain? JAMA. 1992. 268(6):760-766. ↑ McKenzie AM, Taylor NF. Can physiotherapists locate lumbar spinal levels by palpation? Physiotherapy 1997;83: 235-9. ↑ 3. Ferre RM, Sweeney TW. Emergency physicians can easily obtain ultrasound images of anatomical landmarks relevant to lumbar puncture. Am J Emerg Med 2007;25:291-6. ↑ Brennan GP, Fritz JM, Hunter SJ, et al. Identifying subgroups of patients with acute/subacute “nonspecific” low back pain: results of a randomized clinical trial, Spine 31(6):623–631, 2006. ↑ Childs J, Fritz J, Flynn T, et al. A clinical prediction rule to identify patients with low back pain most likely to respond to spinal manipulation: a validation study, Ann Intern Med 141(12):922–928, 2004.